The first time you hunt with your dog is just unforgettable. ..."I was celebrating, and everybody was happy with me. Now I really think that when introducing a young dog to hunting, it is important to have an experienced dog teaching him." Hello and Welcome to my first blog article; I've just returned from a two-day hunting ducks trip and I have something to share with you. It's far below zero outside, and I feel tired from being cold for so long but very fulfilled. My dog is now sleeping by the heater, and I'm typing this story. I finally had my days off work, when I was able to go for a duck hunt with my boyfriend Roman and his friends. So on Friday, I packed, bought some shotgun cartridges for my old Brno 16 gauge over/under shotgun and headed to Roman's house. Everything outside is frozen and covered in snow. 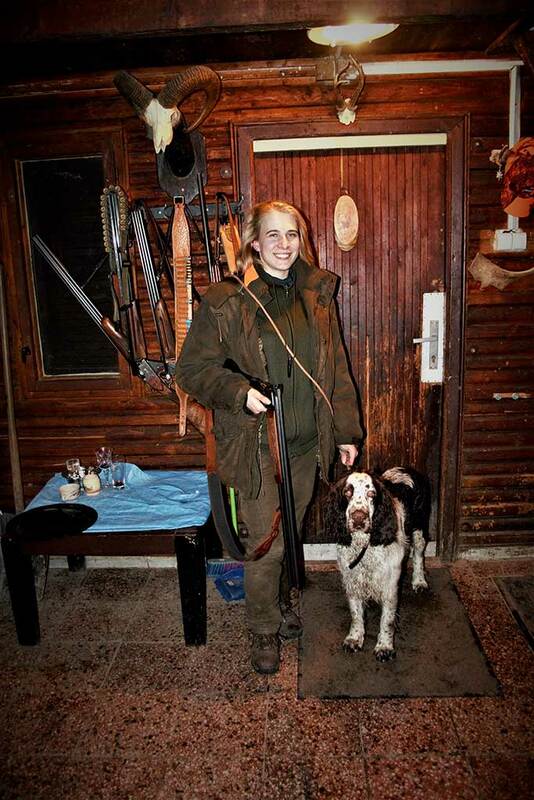 I have Lesan- my English Springer Spaniel walking by my side on a leash and I already loaded my old ZH321 break action shotgun, ready for action. Lesan is just ten months old, and I never fired a shot right next to him yet. A year ago, I was duck hunting with Roman, not having my dog and I can tell you right away, that now I was excited to hunt ducks and Nutria like never before. I felt like I found another half of me, that I was missing. Because I know Lesan is impatient, I took him farther along the river and released him, to flash some ducks, so Roman and his friends can shoot them, upstream. Lesan is jumping trough the bushes in incredible speed, keeping his nose down. I just hope, he will not jump into the icy water. I'm joining Roman in silent waiting on the riverbanks, and Lesan is surprisingly quiet and not moving too much. On the first couple of ducks, I'm not shooting and just watching Lesans reactions to Romans shooting a couple of yards away. Then I spotted something under the fallen tree, on the other side of the river. I went to get the binoculars and decided to take the shot as it's a nutria. (Looking exactly like a giant rat. Pest- Invasive species). I set down in the snow, like when I'm shooting a rifle and laid forearms on my knees. It was getting dark, and I was not able to see any nutria, I was just aiming at the spot I remember nutria to be. I fired a shot. I heard some noise and thought nutria has escaped. I picked up the binoculars and seen a flipping tail of a passing nutria. It's there, I hit it and it looks like a good shot! We sent Romans dog Agar, to retrieve nutria, but because it's still on the banks and not in the water, he does not bring it. I am a bit disappointed, but I'm hoping Nutria will stay there and we will come from the other side tomorrow and get it. The next morning we were all lazy to get up, but we had more hunters coming, so we had to be on time. Once I'm at the spot, morning hunt is always the most magical. Only the process of leaving a warm bed and getting up is hard. Just as in the evening, I pushed some of the areas, and Lesan jumped in the water just for the fun of it, splashing around and biting the water, just like it is summertime. I'm watching him and getting shivers. We move on again, and he turned into an ice ball very quick. Boys wounded some duck. I could tell it landed and was making noises from pain. So, I decided to search for more nutria, and if I see the duck, I will end it's suffering. I did so, and the current was taking bird right where Roman and Agar were. I trough a stick at the duck and sent Lesan into the river. He went with no hesitation and Agar jumped in too. Lesan was at the duck but turned away. He seen Agar coming and quickly took the duck. Agar bit the duck as well and they swam together to the banks. I was celebrating, and everybody was happy with me. Now I really think that when introducing a young dog to hunting, it is important to have an experienced dog teaching him. We all moved to another spot right next to the hunting cabin. Shortly after we arrived, a big flock of ducks flew in. We didn't have time to reload, and another one came. Some ducks fell and one right next to us, but there was a big ice between us. We started breaking the ice, so Lesan can swim and get it. The current took a duck farther, and Lesan jumped in, grabbed the duck and retrieved it to us! The first time, all by himself, in 10 months of age and freezing weather! I am so proud because I was never even training him with ducks before. After his performance, I'm taking him into the cabin and trying to start a fire in the fireplace so that he can warm up. He is still young and does not have such a thick coat as an adult Agar. Boys are coming to help and then it's time to relax and have some lunch. 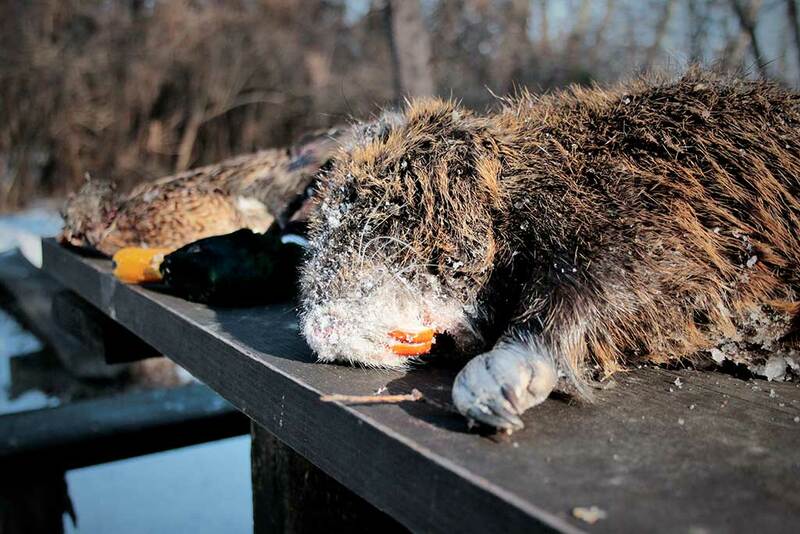 Roman went and brought Nutria from the other side of the river. Guys have never seen it before, and it became a primary interest of everybody around. On an evening hunt, we were patiently waiting in one spot. Hunter on the right of me shot a duck, and it landed in the water. I told Roman to hold his dog Agar and I went with Lesan to get the duck. The current is taking the duck down the river and I'm trying to find something to throw close to the duck so Lesan can swim that direction. It was getting dark, and I managed to send Lesan into the water and was holding the light on the duck. Lesan took the duck the mouth and was swimming back to the banks and climbing over fallen trees and ice, still holding his duck. It was a very emotional moment for me seeing all is effort and drive to retrieve the duck. This is something I was dreaming about, since I first brought Lesan home when he was just two moths old.Since this moment, I feel more respect for my dog and appreciate him even more than before. I know that all he ever does wrong, is my mistake and it's on me now, to make him even better in what he already is. Follow my adventures on Wild Society App! Reloading shotgun shells means studying, being inventive and creative. It is an art... it is the ultimate essence of hunting.